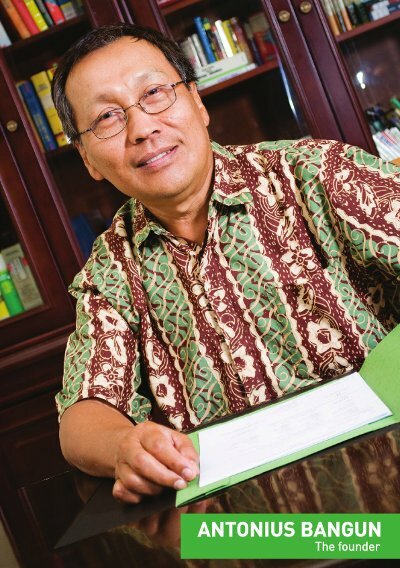 ANTONIUS BANGUN IS A LEADER, A FATHER, AN IDEALIST, AN ENTREPENEUR, AND THE FOUNDER OF PT. KESAINT BLANC INDAH. Kesaint Blanc experienced quick growth and expanded its business into publishing in 1982. Kesaint Blanc Publishing specializes in Foreign Language Learning Books and is, until today, the leading foreign language learning publisher in Indonesia. To support the increase printing demands from new and current customers as well as the printing needs from the publishing division, Kesaint Blanc Printing invested in the latest high volume offset technology. Together with a wide range of offset and finishing machinery, Kesaint Blanc Printing can today provide a wide range of products at competitive prices. We are currently living in a fast growing digital era and to support the increasing technology demands from Kesaint Blanc Printing and Publishing, Kesaint Blanc created a supporting Informational Technology division in 2010. The IT division works along side the printing and publishing divisions to create and support digital products. The IT division has since then expanded its business beyond supporting only Kesaint Blanc, to providing IT services, PC and server rental services, and web solutions to other businesses.